A proposal from additive-manufacturing (AM) researchers at the University of Pittsburgh's Swanson School of Engineering and simulation-software company ANSYS, Inc. is among 13 university-led proposals to capture an Early Stage Innovations (ESI) grant from NASA's Space Technology Research Grants Program. The Pitt team's 3-yr., $500,000 award supports its project, "Prediction of Microstructure Evolution in DMLM (Direct Material Laser Melting) Processed Inconel 718 with Part Scale Simulation." 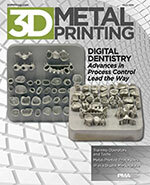 "Additive manufacturing allows us to produce complex metal components that are strong enough to replace machined parts in mechanical applications," says principal investigator Albert To, associate professor of mechanical engineering and materials science and director of the ANSYS Additive Manufacturing Research Laboratory. "However, because of the process parameters and materials used in AM, the microstructure within a part or between different parts can vary widely. Thanks to NASA, our research will focus on developing a new simulation tool to predict the microstructure evolution and stability of Inconel 718, a common nickel superalloy used in laser-based AM in industry." 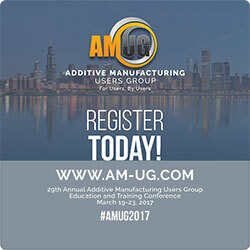 The Additive Manufacturing Users Group (AMUG) will take place March 19-23, 2017, at the Hilton Chicago. The AMUG Conference will include keynote presentations, technical sessions and hands-on workshops designed to help users get more from their AM technologies. Through technical competitions and the annual Awards Banquet, excellence in applying AM and contributions to the industry will be recognized. The five-day event also includes the two-night AMUGexpo, networking receptions and catered meals. Get more information and register at www.am-ug.com. GE has begun accepting applications from schools for its Additive Education Program, a pledge to invest $10 million over the next 5 yr. in educational programs to develop pipelines of future talent in AM. "We want to build an ecosystem for additive manufacturing across multiple industries," said Mohammad Ehteshami, vice president of GE Additive. Here's additional information, including a timeline for the 2017 application and selection process. Group Michelin has partnered with French machinery supplier Fives Group S.A. to develop industrial machines and production shops for 3D metal printing. The new company, Addup Solutions, will develop technology aimed to improve tire performance, by using 3D printing to make molds having highly complex features, such as tread that can regenerate throughout the life of the tire. Ultrasonically bonding thin layers of metal foil allows users to essentially create new metal alloys with unique combinations of mechanical properties. Imagine a "superalloy" with an optimum combination of coefficient of thermal expansion, ballistic response, strength and weight. ...but not for long, thanks in part to the efforts of the recently opened training facility on the campus of the University of Louisville. There, students learn the process from soup to nuts, including design, setup, build and post-processing.